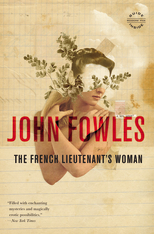 I've put off writing this review of The French Lieutenant's Woman by John Fowles, even though I've finished it weeks ago. I just don't know what to say about it, but here's my attempt. Charles Smithson, a gentleman in the traditional English sense, is all set to marry Ernestina, the daughter of a wealthy merchant. He's convinced himself that it's A-Okay to marry beneath him for a variety of reasons I can't remember but one ain't love. Ernestina is the typical Victorian bride-to-be, all blushes and not at all prepared for the wedding night. While visiting Ernestina in Lyme Regis, he sees a mysterious woman the villagers refer to as "the French Lieutenant's woman" (actually it's "whore" not "woman" but that's too salty for Ernestina's virgin ears). She's said to be pining for her lost love- the French Lieutenant- and spends her time looking out to sea. Appearances can be deceiving, as Charles finds out. When the woman, Sarah, comes to him for help, he finds himself drawn to her. She's all forbidden and stuff. He's pulled between his desire for her and his commitment to Ernestina and what's expected of him. Charles is a guy who can't decide where he really belongs. He wants to be modern, throw caution to the wind, but he's a Victorian male stuck in his role as The Gentry. He just can't let go altogether. Supposedly, Sarah is Fowles's Tess of the d'Ubervilles. I just can't see that. Tess is a tragic heroine because Bad Stuff happens to her over and over again. Sarah is on a hell-bent path of self-destruction for no discernible reason other than she likes being Tragic. No, Charles is much more Tess-like (without all the stabbing), he's the one who ends up paying but in a much more British Gentleman way. Instead of death by hanging, he takes a walking tour of the United States. Even though I wasn't a fan of Charles, I could never put my finger on my feelings for Sarah. Is she playing Poor Tragedy for kicks? Is she supposed to represent the complicated Victorian woman? Or is she going off the rails of a crazy train? I didn't know. Although by the end when she ends up where she does I thought, "Oh. Well, good for her." Stylistically, The French Lieutenant's Woman is....interesting. I read this with my book club and most people liked the author's intrusions and quirks. I felt weird about it. It was a little too clever, like "haha, look at me being in my own story" and "ladies and gentlemen- Mr Gabriel Rossetti!" There's a whole chapter on the sexual habits of the Victorians which while interesting was almost like he had all this research and just wanted to show it to us. He does a lot of little tricks, like he's saying, "this ain't your Granny's Victorian novel." That said, I did like the ending, or rather endings, there's two. It's like having an alternate ending on the DVD version of your favorite movie. I have a favorite but I must keep it to myself. So... I recommend it to fans of Thomas Hardy who want something the same but different. I forget that this has connections with Tess. It's one of my college-mate's favorites and I have it on the shelf but I keep forgetting about it for some reason. Know what you mean about the intrusive author. Takes skill to pull it off without being obvious or annoying. I've been curious about this book for a long time. Interesting review! Hm, I remember when the movie was out and everyone raved about it. I'm not sure I'd like the insertion of the author in the story. I've never read the book, although I fondly remember the film as the first date my first husband and I ever had. It was so misty, somehow, if that seems like a good word. Which it doesn't. Anyway, I'd like to read the book too, someday.